Issued with a matching numbered pilot signed copy of Robert Taylor’s ‘Pacific Pirate’companion print: and the main print signed by additional FIVE Hellcat pilots, a total of NINE signatures. Truk, the small atoll in the South Pacific, was the major anchorage for the Japanese Fleet. Comprising a magnificent harbor and four heavily defended airfields, it was thought impregnable by the US forces as they fought their way up through the Pacific. But on 16-17 February 1944 a violent two-day aerial assault by carrierborne aircraft of Task Force 58 exploded the myth. In just two days the US Navy flyers sunk over 200,000 tons of Japanese naval shipping and destroyed an estimated 275 enemy aircraft, totally eliminating all effectiveness of the Japanese base. Light as the US Navy losses were only 25 aircraft failed to return the battle for Truk was ferocious. The ground installations, ships, and airfield batteries put up intense antiaircraft fire against the attacking American aircraft, while Zeros did their best to repel the onslaught. The air above the atoll became a maelstrom of flak, tracer, flying lead and shrapnel, while below huge explosions rocked the ground as ammo and fuel dumps were hit, fires raged, and the acrid smoke of battle pervaded the entire area. 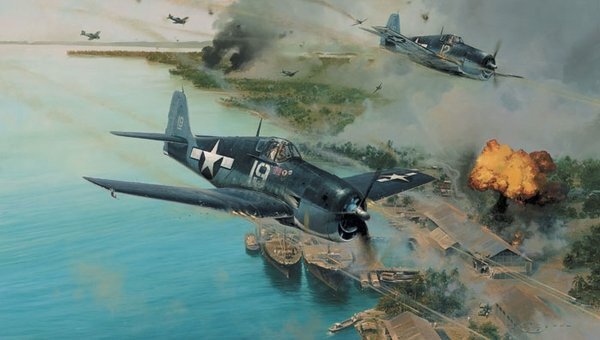 In this important new painting, his first featuring the F6F Hellcat, Robert Taylor brings to life the scenario that was crucial to Admiral Spruance’s forceful drive through the Central Pacific. The once feared Japanese base at Truk is being reduced to a statistic of war. Hellcats of VF6 hurtle across the lagoon at masthead height with guns blazing, creating havoc as they tear into the enemy positions below. Seen in the foreground is the F6F-3 of Lt. Alex Vracui, subsequently to become one of the Navy’s top guns. This exhilarating new work dramatically conveys the awesome conditions endured day after day by the pilots of the US Navy and Marine Corps in the Pacific. With prints signed by a host of US Navy Aces, including the first F6F Hellcat Ace of World War II, Robert has created a limited edition print that will take pride of place in many discerning print collections.